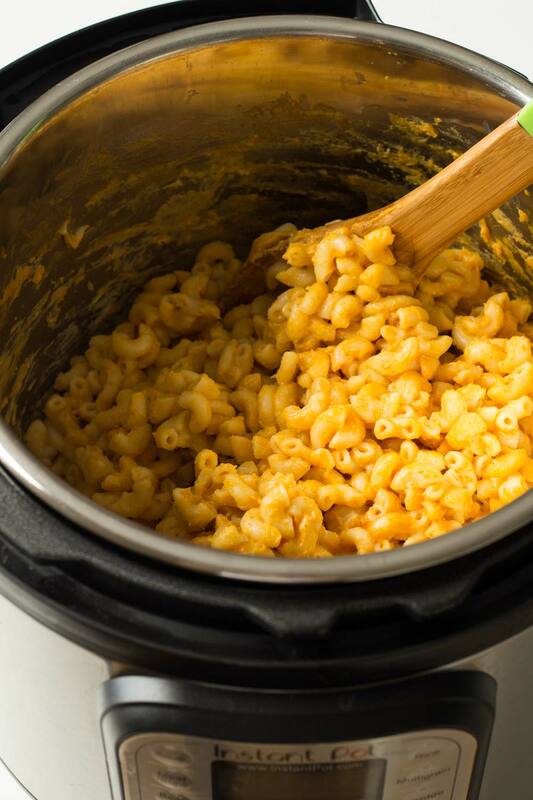 This Instant Pot Mac and Cheese has Pumpkin in it and is wrapped up in the blink of an eye. 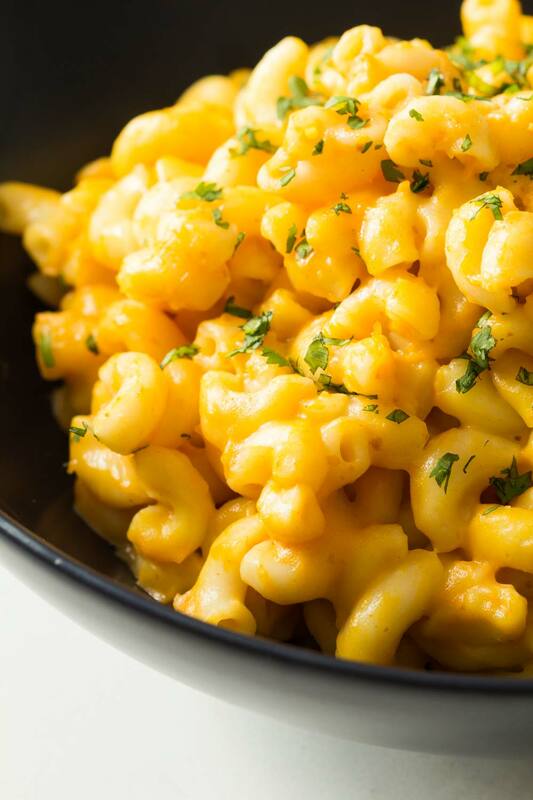 You’ll never make Mac and Cheese in a regular pot ever again. Hi, I’m Lorena from Green Healthy Cooking and writing this post for all of you lovely readers of B. Britnell because Brita just had her beautiful baby girl Jemma that, by the way, has the cutest little nose EVER and deserves all the attention. All of it! So, let’s get right into it. 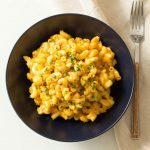 I noticed that Brita has two amazing Mac and Cheese recipes on her blog already. 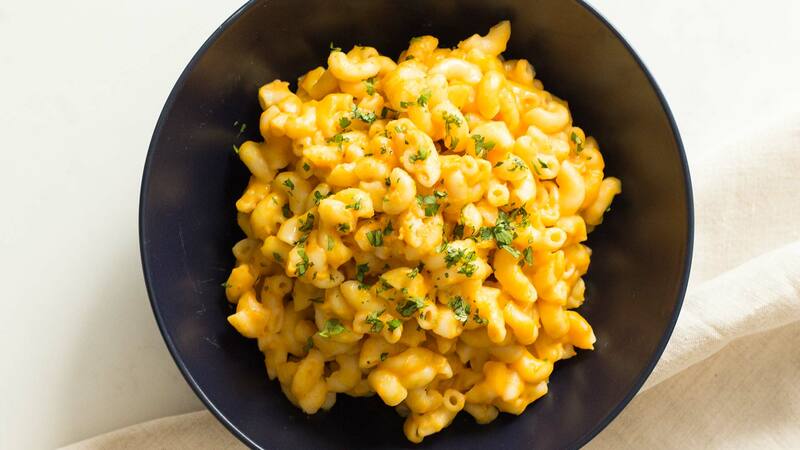 The Best Homemade Mac & Cheese and Pumpkin and Goat Cheese Macaroni. Since both recipes were quite popular, I decided to give you a fusion of both and on top MADE IN THE INSTANT POT!!! Wheeee! Give me a minute to rave about this amazing kitchen gadget. Like can you imagine the Instant Pot makes Mac and Cheese with you having to only dump ingredients and stir twice? Also, it cooks sweet potatoes in a fraction of the time. The best is seriously the pasta though. No waiting for water to come to a boil, watching the pasta to make sure the pot doesn’t overflow, no draining, rinsing, putting back in the pot….. Noooo. Just dump pasta, add salt, pour water, close lid, set time and pressure and off you go do whatever you want in the meantime. So how exactly does this work you ask? So here is the thing. This works for all white wheat pastas the same way. Add the pasta, add salt if desired, and then add just enough water to cover the pasta about 1/2 inch higher than the pasta itself. Give it a quick stir and make sure all pasta is submerged in water. Close the lid, turn venting knob to sealing and set the Instant Pot on Manual to high pressure and 4 minutes. It will take the Instant Pot anywhere from 5-10 minutes to come to pressure and then the 4 minutes high pressure cooking. Once it beeps, quick release the pressure and once the pin drops open the lid and say “woooow”. Give the pasta a quick stir and voilá, finished! Ok, so now that we went through the pasta cooking technique, how does one add the rest of the ingredients? Easy Peasy. The Instant Pot automatically switches on the “keep warm” function once it’s finished doing it’s pressure cooking. It’s like having your pot of pasta on low on the stove. Add the milk, the cheese and in this case pumpkin because it’s basically fall and Pumpkin tastes amazing. Give it all a good stir. Add salt if desired and serve immediately. Add pasta, sea salt and water to the Instant Pot making sure the water covers the pasta completely but not by much. About 1/2 an inch over the pasta. Close lid and turn venting knob to sealing position. Press “Manual”, then “Pressure” to adjust to high pressure, then adjust time to 4 minutes. Once the Instant Pot beeps, quick release pressure (take a step back, if you added too much water, a little bit of boiling hot water may spray out of the vent) and once the pin dropped open the pot. Stir the pasta to avoid from sticking. Add milk, pumpkin puree and cheddar cheese and stir to combine. Serve immediately garnished with freshly chopped cilantro or parsley. Next Post » Plant Based Meal Plan! This was really delicious! The pumpkin added such a great flavor to it & the evaporated milk made it nice & creamy!